My mom used to make this all the time after Thanksgiving or any other time she served mashed potatoes for dinner. Mashed potatoes by themselves are less than stellar the day after, so this is a quick and easy way to not let those go to waste. 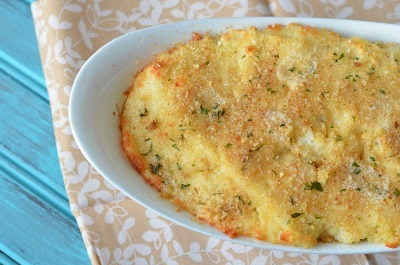 The mashed potatoes are mixed with tons of cheese and topped off with breadcrumbs, resulting in a decadent side dish. Next time you find yourself with some leftover mashed potatoes, think twice before throwing them away or trying to reheat them the next day. Enjoy! Preheat oven to 350 degrees F. Spray a small baking dish with non-stick cooking spray and set aside. If using leftover mashed potatoes, place in the microwave for 1 minute to soften. Mix mashed potatoes with cheese and egg. Spread evenly into prepared baking dish. Sprikle top with breadcrumbs. Dot with pieces of butter. Bake for 20-30 minutes or until crumbs are brown and cheese is melted.